CANTON, Mass. 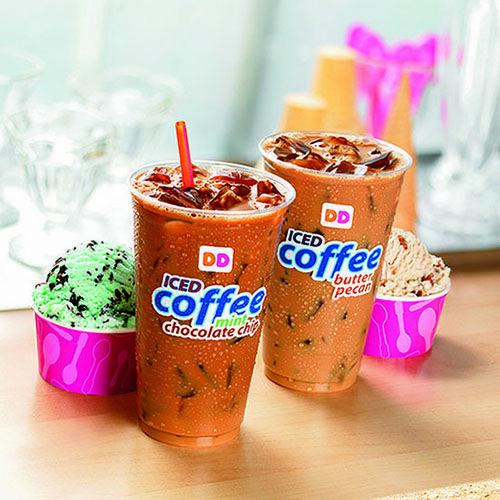 (April 1, 2013) – With warm weather on the way, Dunkin’ Donuts, America's all-day, everyday stop for coffee and baked goods, has two new flavors of iced coffee inspired by a favorite taste of the season, Baskin-Robbins ice cream. For the first time ever, Dunkin’ Donuts has partnered with its sister brand, Baskin-Robbins, the world’s largest chain of ice cream specialty shops, to introduce flavors of iced coffee inspired by Baskin-Robbins ice cream. Beginning today, Dunkin’ Donuts guests can enjoy two “cool” new iced coffee options inspired by two of Baskin-Robbins’ beloved classic ice cream flavors. Dunkin’ Donuts’ Mint Chocolate Chip Iced Coffee offers the refreshing taste of mint, swirled with chocolate and the flavor of sweet cream. Dunkin’ Donuts’ Old Fashioned Butter Pecan Iced Coffee features the flavors of indulgent butter roasted pecans and sweet cream. Both iced coffee flavors are available through spring and into the summer at participating Dunkin’ Donuts restaurants nationwide. Dunkin' Donuts is a market leader in the Iced Coffee category, delivering refreshing Iced Coffee to guests every day, with a consistently smooth, delicious taste. Available in favorite flavors such as Original Blend, French Vanilla and Hazelnut, Dunkin’ Donuts offers guests America’s Favorite Iced Coffee all day to make it easy to keep running. To learn more about Dunkin’ Donuts, visit www.DunkinDonuts.com or follow us on Facebook (www.facebook.com/DunkinDonuts) and Twitter (www.twitter.com/DunkinDonuts). Named the top ice cream and frozen dessert franchise in the United States by Entrepreneur magazine’s 31st annual Franchise 500® ranking, Baskin-Robbins is the world’s largest chain of ice cream specialty shops. Baskin-Robbins creates and markets innovative, premium hard scoop ice cream and soft serve, custom ice cream cakes and a full range of beverages, providing quality and value to consumers at nearly 7,000 retail shops in nearly 50 countries. Baskin-Robbins was founded in 1945 by two ice cream enthusiasts whose passion led to the creation of more than 1,000 ice cream flavors and a wide variety of delicious treats. For the full-year 2012, Baskin-Robbins' shops had global franchisee-reported sales of approximately $1.9 billion. Headquartered in Canton, Mass., Baskin-Robbins is part of the Dunkin' Brands Group, Inc. (Nasdaq: DNKN) family of companies. For further information, visit www.BaskinRobbins.com.